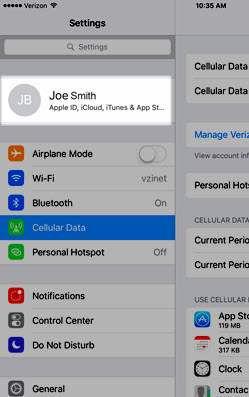 Tap the Apple profile at the top of the Settings menu. If prompted, enter the Apple ID and password then tap Sign In. Tap the desired switch (e.g., Mail, Contacts, etc.) to turn on or off . When switch is turned on, data is backed up. Tap the iCloud Backup switch to to turn on or off. Tap Back Up Now to immediately add or remove the data. A Wi-Fi connection is needed to start a backup. Some features/services require a Wi-Fi connection, aren't available in all countries and access is limited to 10 devices. For additional information, refer to Manage your iCloud storage.